Written by Lauren Jade Thompson. I struggled, writing the end of my short review of The Hunger Games, over just how grand a claim to make for Katniss Everdeen as a heroine. In the end, after much umming and ahing, I plumped for ‘one of the most exciting heroines in film’ which, perhaps tellingly, my editor changed to ‘one of the most exciting heroines in recent film’. Though I deliberately avoided the historical qualification on that term, I might now add ‘mainstream, Hollywood’. But more important in my formulation of that argument, though, was my choice of adjective. There have been various interesting and highly readable debates via reviews, blogs and newspapers as to whether Katniss is a ‘good’ heroine, an ‘empowered’ heroine, a ‘strong’ heroine. Is she a feminist icon, or the princess in the fairy tale? But these sorts of value descriptors are, for me, inadequate at getting to the heart of Katniss, and analysis of the character in these terms is almost unproductive given that she does not stand alone from the world of the film itself, in which to be good, empowered or strong is to be dead. What this Alternate Take intends to do, then, is to get away (as far as is possible) from questions of ‘good’ and ‘bad’ representations, and focus on what excites me about Katniss Everdeen and her representation. In part, I am writing this because I want to understand just why I - a 25-year-old feminist academic vegetarian from Smalltown, UK - feel so inspired by a 16-year-old hunter living in a poverty-stricken mining community in an authoritarian dystopian future on the wreckage of what was once North America. I hope that you don’t mind coming along for the ride. First, I’d like to talk a bit about fire. Oh yes, that’s exciting, isn’t it? It is obviously no coincidence that fire is the metaphor used during the Games to sell Katniss’s persona to the viewing audience. The construction of this image is presented firstly as a departure from the conventions of presentation for District 12 tributes (‘we’re always coal miners’, chirrups Katniss, helpfully), but also as a departure from the media construction of femininity. When Katniss first meets Cinna, she tells him that she knows that his is there to ‘make me look pretty’. Rather, he corrects, his job is to help her make an impression. Fire carries with it an interesting entanglement of connotations. Most obviously, the fire on Katniss’s outfits illuminates her, makes her shine and stand out from the rest of the competitors. Fire is dazzling, and it is also life-giving, having deep historic connections to ancient humans. 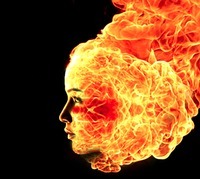 As one of our oldest discoveries, aligning Katniss with fire aligns her to a myth of creation. Fire symbolises rebirth, and Katniss is, in a way, the film’s very own phoenix, rising in flames in defiance of her near-certain death. Fire is also used to allegorise the burning of desire - the desire which is (initially) absent from the love triangle that Katniss finds herself in. The metaphor of ‘the girl who was on fire’, however, in both the film and the books, entraps the audience in a double-bind. We recognise - as we must, since the film insists upon its construction - that this is the spectacular image that has been created in order to sell Katniss as a potential winner in the Games. But we are also seduced by it ourselves. The extension of this metaphor across the narrative makes this no less complex - as Katniss’s fire becomes a spark in a tinderbox, a spark that alights the Districts’ appetite for rebellion. Her fire spreads… well, like wildfire. That the concept of fire can fuel Katniss’s attempts to survive in the arena, a civil uprising within the film, as well as widespread adoration from fans outside of it, is a testament, I think, to what a clever move the metaphor is. But, of course, in order to burn, fire must destroy. The concept of an eternal flame is such a potent one because in reality there can be no such thing. 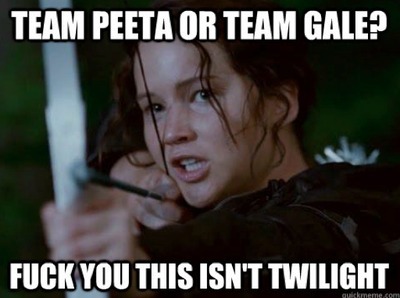 And this is why Katniss fits the symbol so neatly - because she herself cannot heal. As the film shows, she cannot heal from the death of her father, nor the mental absence of her mother. She cannot heal physically while in the arena, where she must rely upon silver parachutes of medicine sent by sponsors, or Rue’s care of her tracker jacker stings. Fire can only survive through damage, and that is exactly what Katniss Everdeen represents. The best characters, the ones that stick with us, are flawed and nuanced - this is why we all think Han Solo is so cool, and no one gives a crap about Luke Skywalker. Harry Potter? Pfft. Everyone’s favourite is Ron, or Hermione, or Draco Malfoy, or just about anybody other than the blank canvas at the narrative centre. Part of the reason that I wanted to avoid here the question of 'good'/'bad' female representations is because this often disallows nuance, flaws or inconsistencies of character - which is, of course, what makes them identifiable and human. (And it should be noted that film criticism and films themselves are usually far more allowing of these character traits in male characters than in women). Furthermore, such analyses which assess the achievements of representation as they relate to gender all too often work to a restrictive hierarchy that posits ‘masculine’ characteristics as desirable and derides the stereotypically feminine. A female representation seen as positive might be defined as such because the character is strong, active, powerful and so on - all the things that women in film are often not. And, don’t get me wrong, it is great to see representations that recognise that women can be all these things and more, and it’s important both that they exist and that we credit them fairly. But we should be careful about reasserting the cultural importance and value attached to characteristics that are (however stereotypically and falsely) perceived as masculine at the expense of arguing for a re-valuing of stereotypically feminine traits. Shouldn’t we also be interested in if and/or how our heroes and heroines espouse positive ‘feminine’ traits? Are they carers? Protectors? Healers? Lovers, even? 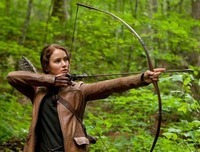 This is another point at which I find Katniss Everdeen an exciting heroine. The character blends these virtues, all to often binarized into ‘masculine’ and ‘feminine’, into one rounded and believable human character. The reaping scene is, I think, emblematic of this. Katniss, on this day, must embody two roles: (1) that of her absent father - hunting, putting food on the table, keeping her mother and Prim steady; and (2) that of potential tribute teenage girl. The camera lingers over her preparation of her appearance in front of the mirror, as if to make the audience aware that this is a preparation for the camera itself. I’ve watched the film twice now, and the moment of Katniss’s volunteering sends shivers up my spine: her voice and expression in equal parts steely and hysterical, the soft drape of her mother’s dress flowing around her frame as she stands tall, broad and rigid. 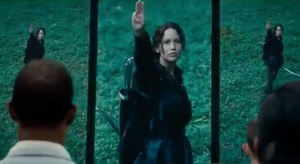 This is her moment of sacrifice - and what Katniss does, she does quite literally in the name of sisterhood. As well as this potentially ungendering amalgamation of traits, Katniss is also an amalgamation of literary ideas and mythical figures. Her bow and her hunting skills seem to recall Diana, the Roman Goddess of the Hunt, whereas the volunteer-tribute-who-becomes-victor narrative is lifted directly from the myth of Theseus. Her position as the figurehead of a class war also remind us of Robin Hood or Joan of Arc, the latter being a comparison that the fire motif discussed above obviously encourages. Her surname seems too close to the heroine of Thomas Hardy’s Far From The Madding Crowd, Bathsheba Everdene, to be coincidental. ‘Katniss’ is named after a tuber, a symbol of her life-giving foraging skills and aligning her with the staple foodstuffs that are a recurring motif throughout the film - the ‘bread and circuses’ theme. With all of these elements and more combined into one heroine, Katniss is made up for us in the same way that she is made up for the cameras and audiences of the games. Credit must be given here too to Lawrence’s particular embodiment of this character - which is one of steeled determination and masked vulnerability, conveying quick and shifting emotions in a very skilful manner. Her performance is full of small flourishes that add up to make a big impression. The shaking of her whole body and that wide-eyed stare as she climbs onto the platform to enter the arena are stunningly moving and affective. Of course, in all of the above, I have but skirted around the most exciting element of Katniss’s character, which is that she starts a frickin’ revolution! Katniss is (however improbably) posited as the only person in the 74-year history of the Games who is able to defy the Capitol on live television, her actions after the death of Rue and with the nightlock berries having major repercussions across the Districts of Panem (more of this to come in the next film, no doubt). As I mentioned in my short review, the great strength in the film lay in its ability to show the how instrumental Katniss was in allowing the vocalising of dissent, and both the riot scenes and Snow’s threats to Seneca Crane convey this, even if we aren’t taken away from the arena quite enough for my liking. As well as the obvious allegory of the cruelty and vapidness of a ruling elite, Katniss is also aligned with a critique of the film’s two major satirical targets - reality television and ‘makeover’ culture. Makeover in the film is medicalised, made into a procedural ordeal in which the end result is not a happy reveal of a “new me” but of the painful and calculated construction of an image-based persona. Anyone, but any woman in particular, who’s ever seen The Swan can’t help but feel the pang of recognition. This Alternate Take was published on April 13, 2012.